Nestled in the fertile valley of Udaipur, beneath the banks of lush Lake of Pichhola stands the shinning, the enchanting pleasure park baptism as Gulab Bagh. It is spread over 100 acres of land at an elevation of 593 meters and having coordinates 24°34′17″N 73°41′34″E. It brings a sense of history and an aura of class which this masterpiece engulfs within itself. As the name suggests it also brings that fragrance and feathery touch of a rose leaf to those who truly appreciates its beauty. Though portraying the scenic imagination of then ruler Maharana Sajjan Singh Ji, it also preserves a sense of history within its cold frames. Gulab Bagh not only represents the traditions of Udaipur but of whole India, an act which can be justified as it is being the fourth oldest zoos in Indian subcontinent. 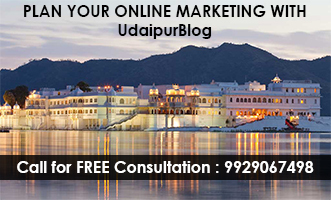 Gulab Bagh is one of the most famous and the biggest of all gardens of Udaipur. The garden was built by the then Maharaja of Udaipur Maharana Sajjan Singh ji in the year 1878 and hence precisely known as Sajjan Niwas Garden but due to the avaiability of numerous varieties of roses, this garden is also known as Gulab Bagh or Rose Garden. The garden consists of a wide variety of flora such as Lotus Pond, and many prominent trees that included many species of mangoes, guava, grapes, lemon, berry, mulbury, rayan, pomegranate, bananas, sapota, tamarind, bullock’s heart , lichi, arjun trees, wood apple, karonda, campher, citron, jamun, pummelo, meetha neem, kargi lime, ficus species, anola, jack fruit, dhanverjia, grandi flora, jasmin, dawood etc. After making the garden prominent amongst the locals, T.H. Story imported variety of flora from various regions of India, their enchanting beauty can be only witnessed here with natural quaintness. Not only this, he also imported from other British colonies, resulting in huge and wide variety of trees and shrubs for the garden. In 1882, a name plate was placed on all the trees which included a Hindi name of the tree, English name of the tree and the botanical name. The boundary of the garden was constructed in the year 1885-86 and the garden was divided into 45 parts according to different flowers, trees, zoo complex and so on. Gulab Bagh also encompasses a museum, originally known as Victoria Hall Museum, laid by Maharana Sajjan Singh on 2nd November 1890. The inauguration was done by Lord Lansdown. 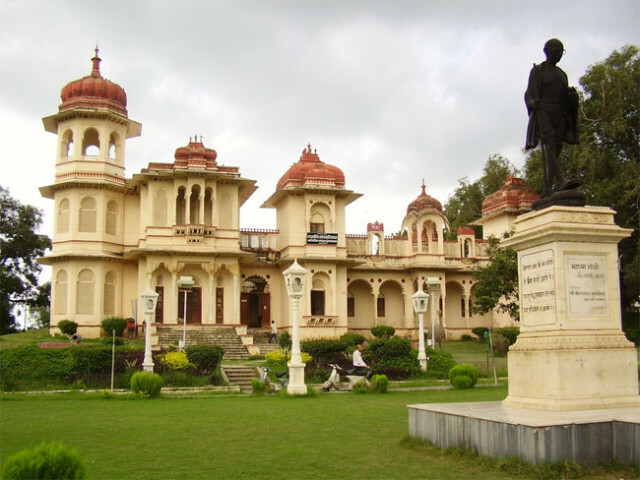 Mr. Gauri Shankar Ojha was the first curator of this museum in the year 1890. This museum proved to be encampment of flimsy collection which comprised of things and many stone manuscripts dating from 3rd Centaury B.C. to 17thCentaury A.D. A library was constructed in the premises of the garden by Maharana Fateh Singh which is now known as Saraswati Bhawan Library. This public library has large volumes and illustrated manuscripts on history, archaeology, Ideology. The museum, reading room and the library are inside the Victoria Hall. The library is replete with Queen Victoria’s displaced statue. The enclosure has a two way entrance for its visitors and the main gate was exclusively made in the eye of Maharana, on the top of it is the sign of Raj Gharana and a lion on either side of it depicts the paradigm of Mewar culture. As entered one can have leisure walk in the tree lined landscape to relax amid the greenery. The location of Gulab Bagh Zoo is unique in the sense of its proximity to the main city and other tourist places as well as the natural environment of dense vegetation of the garden. The garden consists of large ponds covered with lilies and several varieties of trees that provide ample shade to the visitors .The well trimmed shrubs in the shape of animals and the cemented portray of animals ads an enhancement to the garden and urges the passer-by to have snap with them. Municipality has introduced various fun rides for the children and even adults. To enjoy the cherishment of this beautiful scenery there is a famous mini train for kids to have a ride all across the garden. The garden also comprises of a small yet pleasant zoo, showcasing a number of animals. 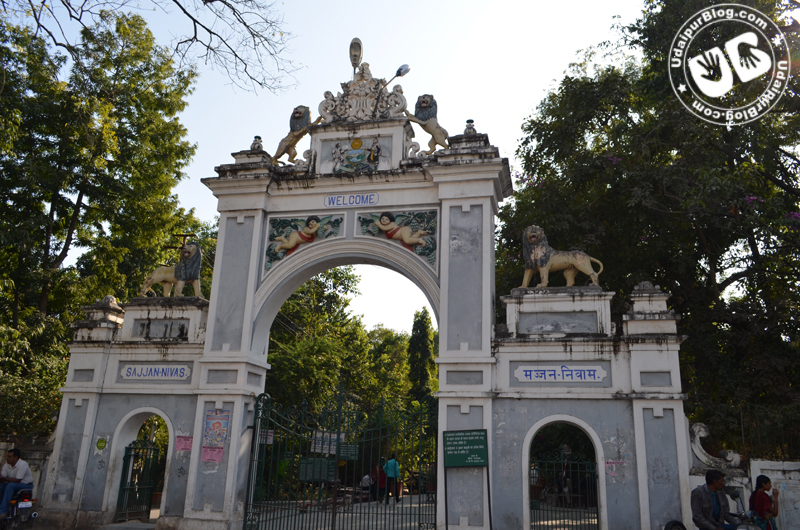 The zoo initially was used as an entertainment for the royal people as organized fights between wild boars, Lions, and Tigers. After independence many animals were shifted to this zoo. The Gulab Bagh zoo is now threatened by plans of the Forest Department to shift it to the biological park being built in Sajjangarh and to convert the zoo into an aviary. The team of Gulab Bagh zoo manages the zoo with tenacious dedication and provides them a temporary home in Gulab Bagh thus it is well maintained and protected. CCTV cameras are also installed inside the zoo to keep a keen eye on the activities of the animals. This small zoo has an array of wildlife including tigers, leopards, Chinkara, gazelle, birds, and many others and has welcomed a variety of new animals including a female leopard and various species of birds. Entry fee to visit the zoo is Rs.5 and camera fee is Rs.15. This is an intact place to visit providing knowledge, fun and pleasure. I must congratulate for unearthing the beauty of our home town in myriad colours. Each one of them is a classic shot. 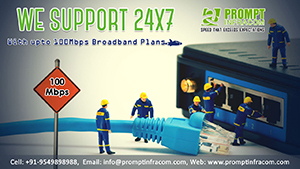 Thanks a lot for the post. God bless. tagline was marvellous n rest was speechless 🙂 chini! !